On My Mind . . . This interview first appeared in Exeunt magazine. You can read it here. Chris Thompson’s approach to theatre feels vital at a time when it can feel as if much of what’s on stage represents a very narrow set of viewpoints, playing overwhelmingly to white, middle class audiences and offering a liberal voice to a liberal audience. As Thompson and I discuss his journey from tour guide on open-topped buses to social worker and finally playwright in the busy Bush Theatre bar the morning after the press night for Albion, his second play, Thompson’s excitement and his passionate belief that theatre should be ‘provocative’ is infectious. In Albion, Thompson explores the rise of the far right. 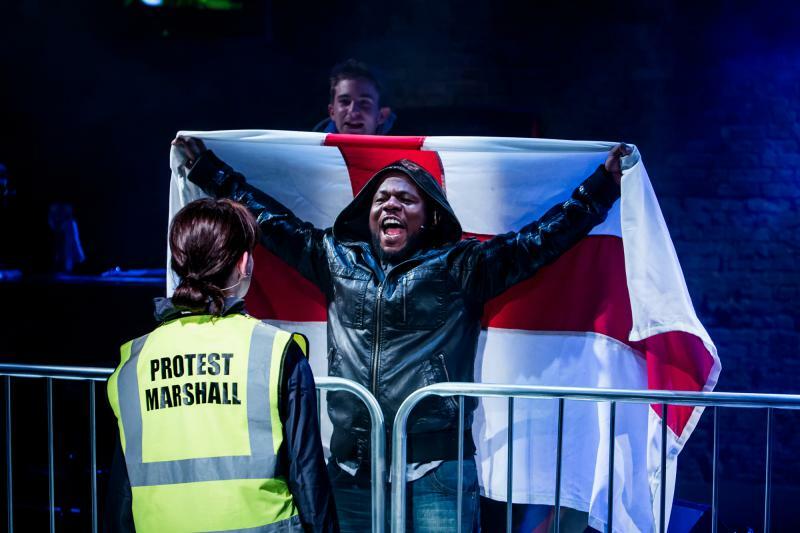 The play is set over two different nights in an East London boozer that is home to the English Protection Army, a group trying to recruit more members among the white working class locals who turn up to the pub’s karaoke night. Thompson’s inspiration came from his surprise at seeing a rainbow flag at a far right rally. Further research demonstrated that far right groups are ‘really complicated . . . a contradictory, conflicting group of people’ whose leaders are ‘learning the language of diversity’ because they want to make their message more acceptable to the mainstream. Thompson makes it very clear that these aren’t his politics, even though he thinks that ‘the idea that a gay person wouldn’t join a far right group is ludicrous.’ Although Thompson believes that the far right says ‘horrible, vile’ things, he is keen to explore the underlying issues, and the actual problem at the heart of what they’re saying. Thompson and I discussed Gillian Duffy, the woman Gordon Brown was overhead describing as a bigot, and the Question Time audience member who was accused of being racist as a result of his comments on immigration, and Thompson strongly believes that these people feel that they don’t have a voice in our society, which our ‘legacy of censorship’ only reinforces. While Albion might not be balanced in that there are no liberal voices (a conscious decision), Thompson thinks it’s vital to offer a ‘balanced portrayal of people’ and try to understand their behaviour rather than immediately dismiss or admonish it. It’s easy to lie about being liberal, Thompson explains, and in Albion he’s asking whether we might actually closer to these far right views than we think we are. Thompson’s debut play, Carthage, was surprising for it’s sympathetic portrayal of a mother who abused and abandoned her son, who later died in care. Here, too, Thompson was concerned with the ‘whole picture’ and the play was informed by what he’d seen in his career as a social worker. Thompson believes that social work and theatre are very similar, and that his previous job, even though it destroyed his creativity for a long time and made him ‘really sad’, also offered him a ‘privileged perspective’ on people and society. ‘So much of social work is needing to see the whole person, to look beneath extreme behaviour. It’s about asking, ‘Who are you?’, not ‘What are you doing?”, he explains. Both social work and theatre are about change, says Thompson, who feels the audience should always leave a play having had a ‘transformative experience.’ ‘You should come out feeling different from how you went in,’ he says. He dislikes theatre that is ‘self-indulgent’ or not about the audience, and thinks a ‘healthy dialogue’ and coming face-to-face with views that aren’t our own is important, rather than theatre that is content to leave its audience feeling ‘smug, superior and self-satisfied’ after having their opinion reinforced. Thompson has now quit his job as a social worker and has been a full-time writer for the past couple of months, but the experience of writing and developing Albion was very different from that of Carthage. The role that the Bush and its development team has played in the genesis of the play is clear, from commissioning it in the first place (‘no other theatre in London would put this on,’ Thompson says), to encouraging him to be ‘fearless and bold’ both in terms of content and form. It’s been eighteen months since Thompson first pitched the idea to the Bush, and throughout that time he has been impressed by their ‘scrutiny and rigour.’ Every play should speak for itself, Thompson says, and he didn’t want to ‘play safe’ with his second work. Given that the play is built around twenty-one karaoke songs and has a ‘really ambitious’ structure that encompasses the past, present and future, it sounds as though Thompson has certainly challenged himself. Albion isn’t a ‘traditional’ form of theatre, explains Thompson, whose mantra while writing was ‘every scene is a song, and every song is a scene.’ Wanting to deliver something ‘extraordinary’ for people who had taken a risk on him as a writer, the play developed from one that featured a karaoke number only at the beginning and end into telling the whole story through song, whether that’s a character singing or a scene that’s underscored by a track. It’s all about ‘expression and censorship’, explains Thompson, and not having a voice, or feeling unable to publicly express what you want. Karaoke, in which people become extreme versions of themselves, is intended to function as a powerful metaphor in a drama about radicalisation and the politics of extremism. In a play about perception that consciously aims to challenge the audience and their views, manipulating them and seducing them, music also functions in the same way as the far right’s ‘palatable’ message: music ‘draws you in,’ says Thompson, who has been delighted, in preview performances, at the audience’s response to their own instinctive reaction to some of the dark, horrible or racist moments in the play. Above all, Albion is a human story with a ‘big heart’. Thompson isn’t sure what he wants to write next, but he always starts ‘with the people’ and wants to write about ‘the human experience and relationships that everyone can relate to.’ His next two plays are receiving one-off readings at the Royal Court and the Finborough Theatre in October and November. Both feature gay characters – and there is a gay male relationship in Albion – but Thompson doesn’t ever want a character’s homosexuality to be a ‘plot point.’ ‘Some people are gay’, he says, and as a writer you need to ‘represent life’, but Burn at the Royal Court is about ‘power dynamics in relationships’ and A Film About Someone You Love at the Finborough is a ‘corrosive comedy’ about ‘rejection and self-obsession.’ There was no one identifiably gay in Thompson’s first play, Carthage, but Thompson says any actor could easily have made a choice for their character to be gay. I am seeing Albion in a couple of weeks and will be posting a review on this blog. I also urge you to see the forthcoming readings of Thompson’s new plays if you can. Burn will be read at the Royal Court theatre at 1.15pm on 17th October, and tickets are available from the theatre’s website here. The Finborough has not yet announced when A Film About Someone You Love will be read, but I have been told it will be in the next couple of days, so check their website soon for further information.